Q. I'm trying to collect the data from my Extreme clock, but it's not downloading to the USB drive. How can I get it to collect the data? A. Replace the AA batteries in your clock. The system was designed so that the first indication that your batteries are running down is that you won't be able to copy the data to the USB drive, but believe it or not, the clock can still accept clock-ins and clock-outs from employees, because those use very little power. Use alkaline batteries and replace them annually. Q. The time and date on my computer are correct, but when I transfer data from the Vetro clock to my computer, all the transactions have a date of 2010. What's going on? A. It looks like you need to correct the time on your Vetro clock. If you have your Vetro plugged into your network, you don't need to worry about this—your clock gets its time from whatever PC is running Vetro Data Manager. At the Vetro clock, press "99," then "OK," followed by your password. The Administrative Menu will appear. Press 2, which corresponds to "Date/Time" in the menu. Follow the on-screen instructions, using the keypad to enter the date and time. Repeat this process for each of your Vetro clocks. Q. One of my employees is leaving the company and lost their iButton. How do I disable that iButton so that anyone who finds it can't clock in? In the employee's profile in TimePilot Central, simply delete the iButton number in the "iButton" number field. In the employee's profile in TimePilot Central, delete the iButton number in the "iButton" number field. Enter Administrative Mode on your Vetro clock (99 > OK > password), select “Assign iButtons” from the clock’s menu by entering its menu number (4) on the keypad and follow the instructions to clear the iButton. This process will change the employee’s iButton serial number to all zeroes. Q. I want to assign a former employee's iButton to our new employee. How do I do that? A. It's a two-step process: first you remove the iButton from the former employee's profile, then you assign the iButton to the new employee as if it were a brand new iButton. First, in TimePilot Central, call up the profile of the employee who will not be using the iButton anymore and delete the iButton number. If you're using TimePilot Vetro, follow the instructions in the previous question to clear the former employee's iButton from the Vetro clock. Next, assign the iButton to the new employee as if it was a new iButton. See your user manual and/or the help system in the TimePilot software for instructions. TimePilot Tips: Extreme batteries, correcting the time on Vetro and reassigning iButtons. TimePilot Best Practices: Buffer Zones for busy businesses. 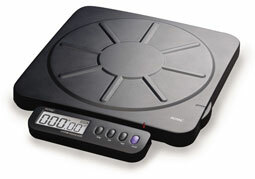 Cool stuff: Shipping scale with a wireless remote display. The deal: Discounts on upgrades to the TimePilot IV software. The TimePilot software has been designed to be as simple or as sophisticated as you want it to be. Many customers want to keep it simple, and will never use its advanced features. That’s fine—the software is perfect for that. But other customers have more complex situations, and we’ve tried hard to accommodate them, too. This is the first in an occasional series describing some of the more advanced features of the software. Let’s say your company has shifts running 24/7: The last shift in the Pay Period ends at midnight Saturday, and the first shift of the next Pay Period starts at midnight Saturday. Here’s the problem: Some of the employees in the last shift of the Pay Period will clock out after midnight, putting their clock-outs into the next Pay Period. And some of the employees in the first shift of the Pay Period will clock in early, putting their clock-ins into the previous Pay Period. The result will be that when you extract the Pay Period, not all the transactions that should be in this Pay Period will get extracted. What should you do? One way to think of the TimePilot system is to imagine that all the transactions—the clock-ins and clock-outs—are dumped into a big pot. (It’s really called a database.) When you extract a Pay Period, you remove from the pot only the transactions that occurred between the start time and the end time of your Pay Period and place them in a different pot for processing. To get all the transactions into the right “pot,” you’ll need to adjust your Pay Period and set an “In” Buffer Zone, an advanced feature in the TimePilot’s software. First, adjust your Pay Period so that it ends an hour or so after anyone in the last shift of the Pay Period might possibly clock out. This will ensure that you catch every clock-out transaction when you extract the Pay Period. In our example, you’ll set your Pay Period to start at 2 a.m. Sunday and end at 1:59 a.m. the following Sunday. Because the last shift of each Pay Period ends at midnight on Saturday night, employees can clock out almost two hours late and still have their clock-outs show up in the Pay Period. But wait! Starting the Pay Period at 2 a.m. will leave out lots of clock-ins from the first shift of the week! Don’t worry—that’s addressed in the next step. Now you can use the “In” Buffer to catch the “In” transactions that occurred before the Pay Period began and include them in that Pay Period. Essentially, you’re s-t-r-e-t-c-h-i-n-g the start of the Pay Period, but to include only clock-ins. By setting the “In” Buffer to 240 minutes (four hours), any clock-ins that occur between 10 p.m. Saturday and 2 a.m. Sunday at the start of the Pay Period will be included in the Pay Period you are extracting, and any clock-out transactions in those four hours will be left behind. Now anyone who clocks in early or clocks out late on Saturday nights will be included in the correct Pay Period and their overtime hours will calculate correctly. Works on Windows 7 and other Windows 64-bit versions. Add, delete and edit employees right on the same screen where you view their clock-ins and clock-outs. Attach notes to any clock-in or clock-out and keep track of jury duty, bereavement and paid absences. To learn more about the TimePilot IV software, click here. TimePilot IV Upgrade AND renew your Annual Technical Support Agreement for $169 (total savings of $79! ).